Now let’s look a little closer at our Pythagorean Expectation — derived through PythagenPuck. In the standings tables I posted in Parts 1 and 3, I included the number of one-goal wins and one-goal losses for each team. It’s intuitive that a team that wins a large percentage of its one-goal games will have a higher point total than expected through our formula. To confirm that, we can plot one against the other. We find that one-goal winning percentage explains 25 percent of the variance in our point differential, which is fairly significant. 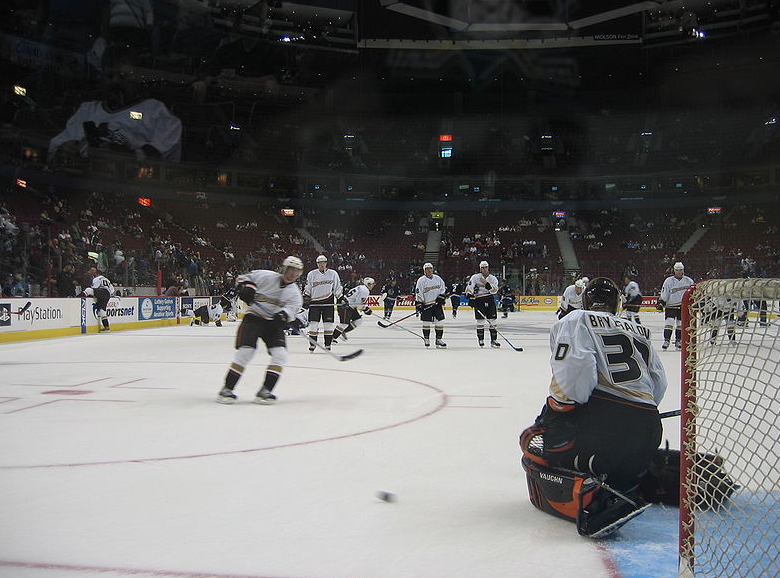 If we look at Anaheim’s last couple of seasons (its 2014 campaign is unmarked but is the point at about (0.8, 8), it is a team that has regularly surpassed its expected point total, and its record in regulation one-goal games (34-5) is a large reason why. So let’s get back to our original question. Is there a connection between ability when leading and ability to outperform Pythagorean expectations. Let’s look at some correlations. For expected goals against per 60, the data is since 2006. For the other three measures, because of some data inconsistency, the data only goes back as far as 2008. That doesn’t look too promising. There doesn’t appear to be any connection overall. But maybe we’re trying to jam too many variables into this mix. We know that even one-goal winning percentage only accounts for 25% of the variance in these differentials. So even small connections above would likely be swamped by variance. Instead, let’s back up by a step. If we know that one-goal game winning percentage impacts these differentials, does play with the lead in past years impact current one-goal game differentials? Let’s examine that. It looks like there’s something there. Teams that give ice time while leading late in games to those who have had success protecting leads in the past appear to win a larger percentage of their one-goal games. And it appears as though scoring chances against is the strongest measure. 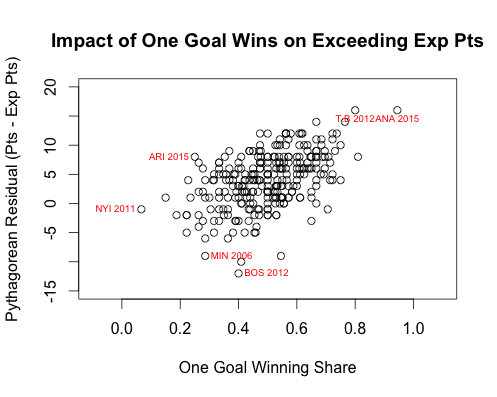 This theory is backed up if one runs a linear regression using only expected scoring chances against per 60 to predict one-goal winning percentage. The model shows our r-squared value at a modest but notable 0.1 and a p-value well under any accepted threshold indicating significance. It’s also interesting to note, and not altogether surprising, that the section of the W-L record that is impacted is the number of wins. Hiring players with an ability to protect leads correlates well with the number of one-goal wins because if a team blows that lead, generally the game goes to overtime. It doesn’t become a one-goal loss, it simply becomes an absent data point. The number of one-goal losses, it is interesting to note, has a very slight association with players who can score when trailing, but to a less significant extent. Click here for the full list of teams and their expected lead protection metrics by year, and here is the list of players’ score chance against histories going into 2015-2016. While Anaheim’s 2014 and 2015 numbers are merely above average, not top of the list, the 2012 New York Islanders, who you’ll remember were identified on the graph above as having the worst one-goal win share of the last decade, also had the highest expected scoring chances against number. The top 10 and bottom 10 teams of the past decade, as well as the players with the best and worst expectations going into 2015-2016, are posted below. This entry was tagged analytics, nhl, one goal wins, pythagorean expectation, scoring chances. Bookmark the permalink.